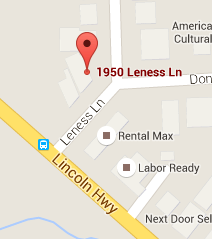 Location: Our shop is located in Crest Hill at 1950 Leness Lane. We are behind Rental Max off Route 30 west of Larkin next to Toton's TV. We continue to improve this much larger building with more room to service our clients. Local Family Owned: In 2001 our business was founded in a Shorewood storefront by the wife of a Joliet policeman. In 2003 the shop moved to Joliet with expanded cleaning capabilities as the new owners, Bert & Miriam Bolton, continued to grow the business and its services. Having outgrown the old location, in January of 2016 we moved to our present location in Crest Hill. We've serviced over 6,000 clients across the Chicago region and NW Indiana. Whatever the size of your project, we strive to provide a personalized professional cleaning, whether you have one blind or a thousand. While we do large residential and commercial jobs, our focus has been on delivering consistent, quality services for all types and sizes of projects, not just cranking out production. Referrals from our clients, decorators and other professionals keep us active. 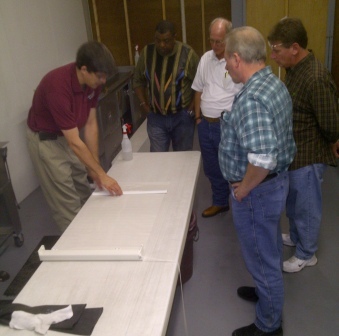 Expert Blind and Drapery Cleaning: Not only does our team have years of experience in what they do, we also believe professional development, education and training is also important. The blend of certifications, training and product knowledge of the various window treatments, cleaning procedures and use of equipment and cleaning chemistry our team member posses put them near the top of our profession. Several times a year we host cleaners from across the US and Canada (and as far away as Australia) in our facilities for training. We interact regularly and consult with blind cleaners and fabricators from around the world as our office space is shared with a national network of professionally minded blind cleaners - Blindcleaners.biz. Why not put this local expertise to work for you? Office Staff: Miriam is often the friendly voice on the phone and the one that tries to keep things organized in the office. As our business operates by appointment our work schedules vary, so please leave a message if someone doesn't personally pick up your call. Often we are either on another line helping another client or busy with another client and will get back to you just as soon as we can. If we don't call back in a few minutes, then we may be out of the office for a bit (or occasionally even for the day) working in client's homes or businesses. Joshua rejoined our team last year. He's quick to pitch in and help where ever needed and may be found doing almost anything around the shop or out on a job. He's an IICRC Certified Upholstery Cleaning technician and knows quite a bit about what is necessry to support many of the other services we provide. Bert While his height lends itself to efficient take downs and re-hangs (and much longer cleaning strokes on draperies) his involvement goes beyond the cleaning side of the local operation. As the administrator of a national network of professional cleaners, he or one of our team may be able to connect you to someone else that can help you - if your project lies outside of our service area whether you live in the Chicago region or in British Columbia, New Zealand or New York. His professional credentials include being a Hunter Douglas Certified Professional Installer, Certified Fabricare Specialist (13 years+), IICRC Certified for Upholstery/Fabric and Carpet Cleaning Technician. In his "spare time" he writes articles and develops materials for consumers and professionals regarding various aspects of the blind cleaning industry. Developing new LockDown Shades is a favorite hobby and he now has three patents for specialty shades used by schools, businesses and government buildings across the US and Canada in Lock Down situations. For larger jobs, when more hands may be needed, we call upon other part time employees to get things done as quickly as needed. 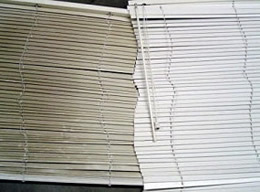 Our real world experience and knowledge of custom blinds and draperies allows us to provide personalized quality cleaning services. The pictures seen on our website are not "stock" photos or "staged" illustration shots but actual projects we've done. Give us a call at (815)-577-9797 to learn more about our services. How may we put our expertise to work for you? 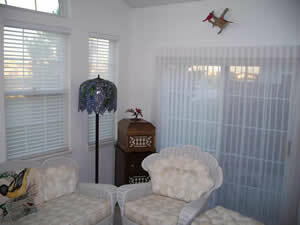 Professionally, we provide consulting and training services both locally and nationally to other blind cleaners. 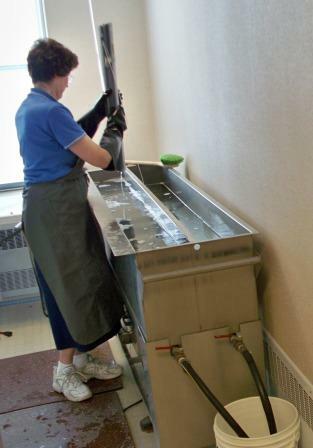 If you are a blind cleaner or investigating this niche cleaning market as a possible business opportunity, feel free to contact us through www.blindcleaners.biz for more information. 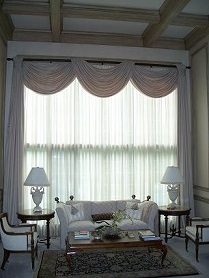 Drapery dry cleaning can be done in your home.